Training of the employee is very important if you want to drive your business on road to success. To well trained, the employees should constantly learn newer skills in their relevant field to refresh their knowledge and groom their personality. It is important to encourage each employee working in any organization to attend the training session if there is any. Many organizations offer a training program in their benefits package. After the completion of a training session, it is important to check whether the training was useful for the trainee or not. At the end of every training session, the employees are asked to give their feedback about the effectiveness of the session. This will help the trainer to well tune the process of training in future. The training evaluation form is a kind of feedback form which is filled by the trainees. The document consists of a number of questions related to the training which is required to be answered by the trainee. The information from the training evaluation form can be stored in MS Excel document to make the complete database of the feedback. If you want to ensure the smooth working of an organization, it is important to give the sufficient training to its employees. With the use of high-quality trainee evaluation form, it is made sure that the employee is being given the appropriate amount of training. 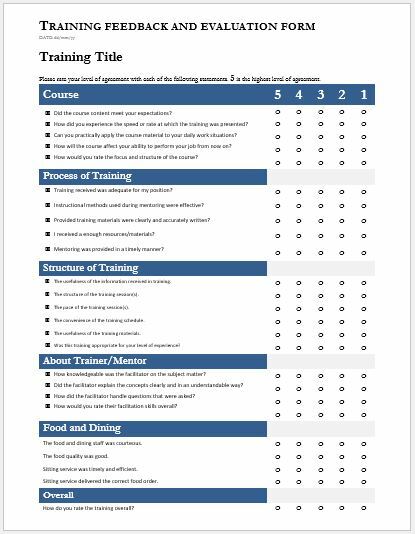 These training evaluation forms can be distributed to all the trainees through email or they can also be the hard copy of the form. The evaluation form enables the organization to know about the opinions of the attendees. The satisfaction level of the trainees, as well as the success of the training program, can be predicted using trainee evaluation form. This survey also makes the trainer come to know about several flaws which are present in training program. The trainer can then put his efforts to bring improvement in it. You can assess the success of the training session in many ways. There are a number of questions in the training evaluation form. Designing all these questions can be very time taking. If you want to save your time, you can use a readymade template available on many websites. These templates can be edited and can be used when required. Using a template can be useful in a number of ways depending on the size of the company. The trainee evaluation form improves the training skills of the trainee. The successful training is one in which the trainee completely absorbs whatever he is taught. The feedback of trainee should be solicited so that the impact of training on the individual trainee can be seen. The training evaluation forms are quite like the product or customer feedback form. The training session in this situation acts as a product and the trainee evaluates it just like a customer. The training evaluation forms are no doubt the best way to improve the training sessions.